Docsvault has introduced a very interesting feature – Document Request Link. This new feature makes it easier to receive files from anyone and will be available to all Docsvault Enterprise & Ultimate users in the latest v 10.3. You can now request multiple people to upload documents to a specific Docsvault folder. 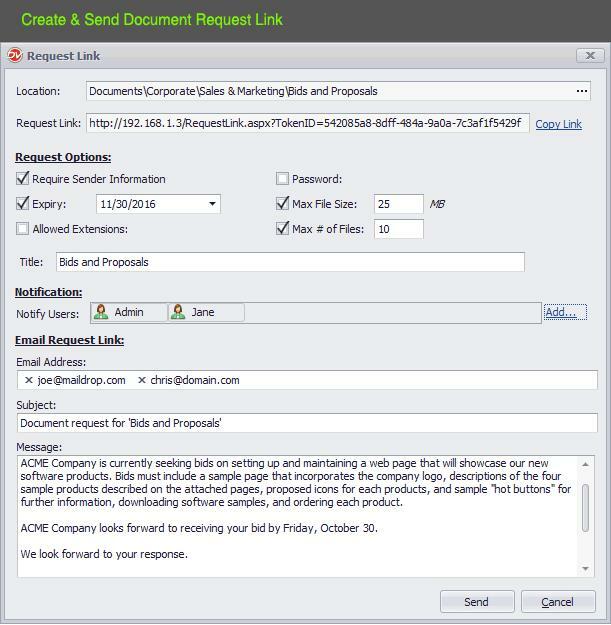 All you need to do is create a Document Request link on any folder in Docsvault and send it via email, instant message or embed the link on your website. Receivers of the document request link do not even need a Docsvault account to upload a file. At the same time, you can control who can access your link for upload and for how long by setting password and expiration. You can even set the limit for file size and maximum allowed number of files to be uploaded. All the requested files are automatically organized into the collect folder, available on all your devices with Docsvault. Document requests works best on both desktops and mobile devices. On desktops, users can simply drag and drop multiple files from their desktop to their web browser to send you files. On mobiles, users can access the document request link and upload files from their gallery or other supported apps right from their mobile browser. This feature can be used for a range of scenarios, whether it’s collecting bids from contractors, asking for ‘Income Statement’ from your client or a teacher collecting homework through a document request link.